We are not just software developers we are a team of highly skilled and highly motivated professionals inclined to deliver a comprehensive solution to meet even the most challenging objectives. We are ready to take charge of even the most complex projects. We do whatever it takes to make sure we finalize the project and customers objectives are met in full. SOLVO offers the most flexible and efficient IT solutions for logistics that would anticipate the changing needs of the client. The relationship between SOLVO and Hamburger Hafen und Logistik AG (HHLA) – a German logistics and transport company that manages three container terminals in the port of Hamburg: Altenwerder, Burchardkai, and Tollerort – began in 2016 when HHLA daughter company, Hamburg Port Consulting GmbH (HPC), became a strategic partner of SOLVO during the implementation of Solvo.TOS at the port of Hammad (NPP) in Doha, Qatar, a project commissioned by Mwani and IBM Qatar. In the beginning of November 2018, the official distributor of SOLVO in Europe, Solvo Europe B.V., signed an agreement to implement Solvo.TOS at the Muuga container terminal with HHLA Estonia AS, part of the HHLA group. The new 6.0 version marks a leap forward for SOLVO with marketing director, Daniel Pershin, calling it a “major release” due to new unified system architecture. “Whereas before we had different systems - one for containers only, another for breakbulk and so on, now we merged two systems into one comprehensive solution that supports all kinds of cargo, such as containers to breakbulk, project cargo, bulk, you name it,” Pershin explained in an interview with Breakbulk Media. What’s more, the new software also is “completely web-based,” according to Pershin who describes Solvo’s latest TOS platform as now having “service-oriented” focus with the ability to support new modules such as unified vessel stowage planning. “This new system makes the lives of planners much, much easier,” he adds. 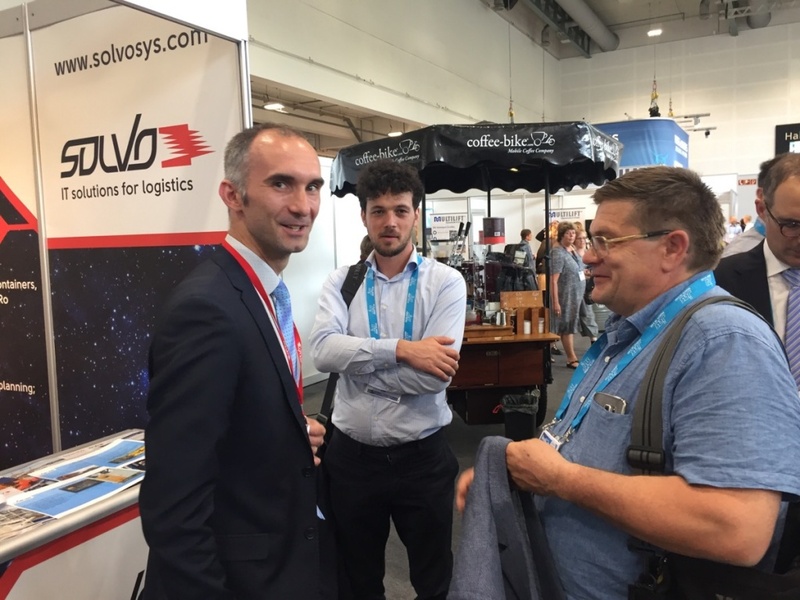 SOLVO took part at the international transport and logistics exhibition BreakBulk Europe 2018, May 29-31. Breakbulk Europe is the biggest exhibition in Europe dedicated to general cargo logistics. It is an annual event where leading logistics operators, shippers, ports, forwarders, carriers, industry experts, and IT solution providers come under one roof to network, showcase their latest products, and share their experiences. This year, the event was held for the first time in Germany at the Messe Bremen complex in the city of Bremen. SOLVO received visitors to its stand along with its exclusive European partner, Solvo Europe B.V., demonstrating its terminal operating system Solvo.TOS 6.0: a unified platform for managing all cargo types and simultaneously tracking, planning and controlling not only various parts of the terminal (port), but also processing various types of cargo including container, general, and Ro-Ro cargo. The event also included an interview between Daniel Pershin, head of SOLVO marketing, and representatives of BreakBulk Europe organizers. Pershin discussed the prospects for port logistics development and shared insights into the capabilities of Solvo.TOS 6.0. TOC has long been considered best in class by container terminal operators and their suppliers where port operations, shippers, suppliers, IT solution providers and more come together under one roof. This year’s event will be held at Ahoy Rotterdam, The Netherlands, June 12-14. SOLVO is proud to once again be taking part this year, following last year’s successful event. Visit SOLVO’s stand #C72, Hall 1, to check out the latest solutions and receive a free souvenir. Learn about the latest version of our terminal operating system Solvo.TOS 6.0, which successfully combined Solvo.TOS Container and Solvo.TOS General Cargo into a single unified platform for all cargo types! The new platform features an all-new WEB interface, new built-in stowage planning and equipment optimization module, block-train management, berth planning, KPI dashboards, resource planning, VGM compliance, and much more. On June 12, visitors will also get a chance to join the Operating Smarter Session at TECH TOC from 14:45 - 16:00 with speakers Giovanni Migliaccio, Vice President, Solvo Europe B.V, and Daniil Pershin, Director of Marketing and PR, Solvo LLC. Cutting-edge technology to help boost container terminal operations efficiency: vessel and rail planning, yard optimization and gate management. Based on case studies in the Antwerp Euro Terminal (AET) operated by Grimaldi Lines and Novosibirsk rail terminal. -What factors affect TOS implementation complexity at the multipurpose facilities? -Gate optimization: how to save if OCR is just a bit too early to think of? SOLVO looks forward to seeing you at this year’s TOC Europe in Rotterdam! 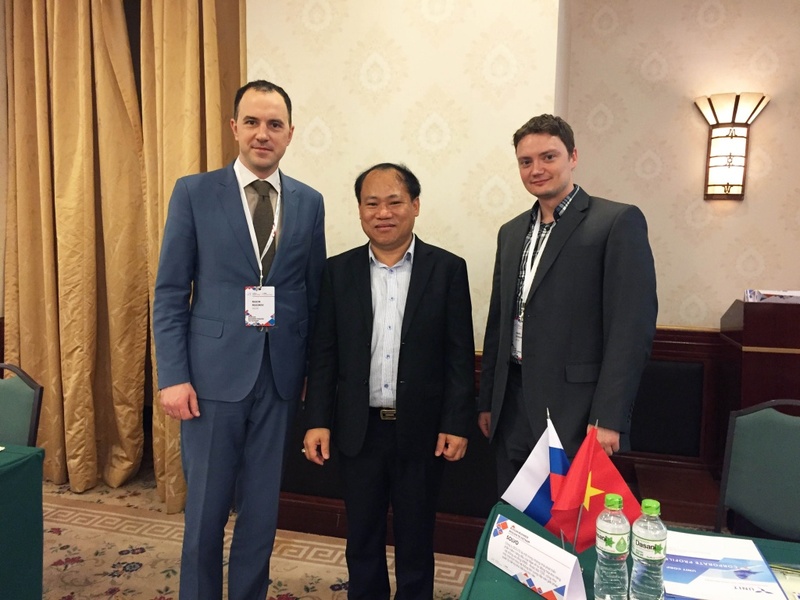 April 2-13, 2018, saw SOLVO taking part in a business mission of Russian exporters to Vietnam, which was organized by the Russian Export Center (REC) in association with the Russia’s Ministry of Economic Development and the Ministry of Industry and Trade. To facilitate the development of trade and economic ties between Russia and Vietnam the mission included over 30 Russian companies from all industries: energy, machine-manufacturing, agriculture, IT, and others. The main goal of the business mission was to strengthen economic cooperation, promote Russian products and businesses on the Vietnamese market. The event was also coincided with the opening of a Trade house in Ho Chi Minh City and the 28th International multi-industry exhibition Vietnam EXPO 2018 in Hanoi. Under the auspices of the Russian Export Center, SOLVO company representatives were able to connect with potential partners and clients from various regions of Vietnam and visit Haiphong, the biggest port in northern Vietnam. Despite the relatively high level of logistics process automation in Vietnam, many local representatives showed keen interest in SOLVO’s products and solutions such as Solvo.TOS and Solvo.WMS in particular, due to their innovative features, accessibility and functionality. SOLVO would like to thank the Russian Export Center for the ability to take part and help the business mission to Vietnam. For the 2nd time Solvo will be exhibiting at the biggest international logistics event in South America. This time together with the official sales partner in San Paulo - Prosegur. Intermodal South America is the leading integrated exhibition and conference event for international trade, logistics, transport and cargo handling in Latin America, offers over 450 exhibitors from all over the world, presenting new products, the latest equipment and technology innovation and a vast conference program, providing the unique opportunity and experience for more than 45 thousand professionals. 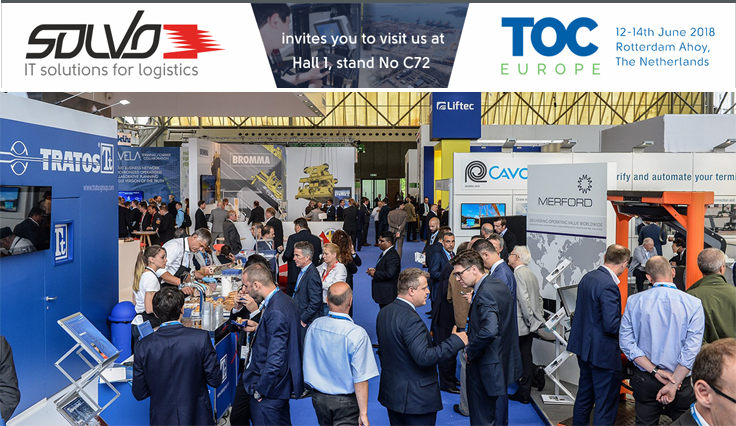 Solvo and Prosugur joined forces at the stand No 5-20 to show the latest developments in terminal operating software for ports and contanштук terminals as well as in WMS software that helps boost intralogistics in such environments as DCs, production warehouses, 3PL warehouses. In 2017, Solvo.TOS ver. 5.0 was successfully implemented at the Murmansk transport affiliate of Nornickel, the biggest producer of Palladium in the world. In March 2017, Nornickel completed the modernization of its transshipment terminal in Murmansk, which became one of the biggest investment projects for transportation infrastructure development north of the Arctic circle. The new transport-logistics hub can process 1.5 million tons of container cargo per year. The warehouse zone is 100,000 sq. meters. Berths are equipped with portal cranes with a lift capacity from 40 to 80 tons. The yard uses reachstackers, forklifts and two gantry cranes equipped with lift control system and automatic spreaders capable of lifting containers weighing up to 40 tons. Reduction in time trucks spend at the terminal. Automatic generation and issuing of tasks for tallyman and CHE drivers, and more. This type of automatic made it possible to minimize the number of unproductive moves, optimize CHE usage and human resources, while reducing human error to increase overall productivity. Solvo.TOS takes into account the specifics at the ship operations area. Portal cranes are used for load handling operations at the berth instead of standard quay cranes. Containerships, which dock at the terminal are also typically non-standard - not with with 40 foot bays, but ice-breaker ships where containers are loaded in the common cargo hold. Solvo.TOS supports container transfer between terminal yards, which is performed via either road or rail. The truck operations area now supports automatic dual permit creation for gate entry: for the so-called “material” payload and also for the transport vehicle and driver. “Despite the affiliate using it for less than 1 year, it can already be confirmed that automation system implementation improved operations at the terminal, while further expansion of functionality and development of Solvo.TOS is expected to further optimize processes and boost efficiency at the Murmansk port,” adds Sidorenko. The terminal’s future plans include the implementation of Solvo.TOS for managing general cargo operations. SOLVO has been shortlisted to win the award category ‘TOS Technology Company of the Year ’ at the Transport Arabia Excellence Awards 2017 ceremony, which took place on December 4th, 2017 at the Roda Al Bustan Hotel in Dubai. The given award is given to the Terminal Operating Systems software company that has brought the most innovative TOS software in the market in last year. Boost to terminal productivity in terms of speed, operational efficiency, energy efficiency and cost reductions will be the primary criteria for this award. SOLVO has successfully completed the implementation of a 'Smart Container Terminal' at TransContainer’s Novosibirsk rail terminal in Russia. Software solutions, Terminal Management Systems, terminal operating system, solutions for logistics, warehouse management,specialized warehouse, warehouse equipment such, equipment such, weighing devices, equipment solvo, kpi visualization modules, visualization modules , warehouse, Warehouse Equipment, Specialized Warehouse Equipment, solutions, systems integration, Cargo, WMS,TOS, consulting services,scanning and mobility solutions. Copyright © Solvo Europe B. V. Design by zenon design.